Home area rug cleaning Vegetable Dyed Persian and Turkish Area Rugs. How Do They Do It? Vegetable Dyed Persian and Turkish Area Rugs. How Do They Do It? Before the advent of “chemical” or “chrome” dyes, the Persian dyeing technique of wool was performed by villagers who were experts in producing the colors required by weavers to create the beautiful vegetable dyed rugs seen today. When sheared from sheep, wool may either be a light off-white ivory color, or a dark brown to black. Both may be used in Persian rug weaving, but it is the ivory wool that is easiest to alter through the process of dying to produce beautiful textiles and rugs. 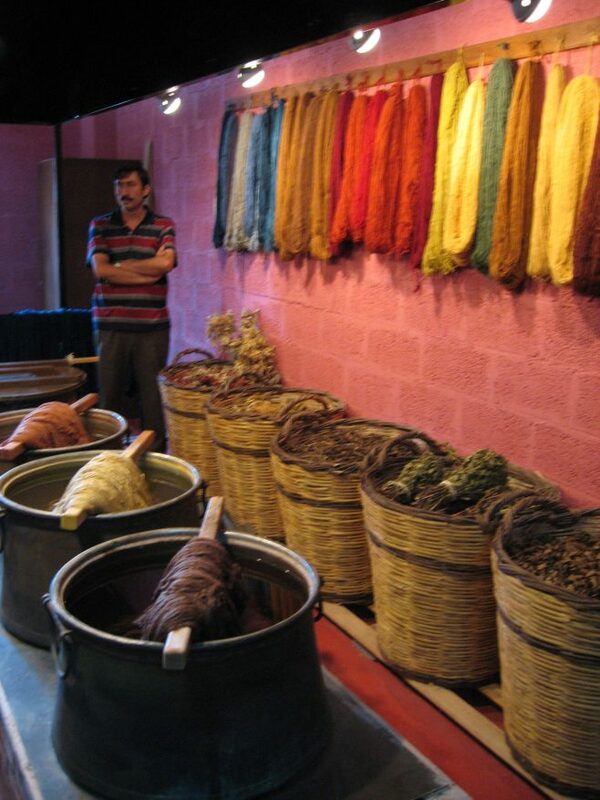 The earliest traditional dyes were those made from various vegetable sources. Vegetables, plants, and yes even bugs were mixed with water in a liquid form to allow the wool to soak and transform to just about any color you can imagine. Madder plants yield a range of colors from orange, reds, and purples. Saffron will produce yellows and Indigo will create shades of blue. Various other colors are made by mixing Saffron with Indigo or cobalt, and multiple shades of red or violet can be made with insect dye or lac which is derived from the shells of beetles. Beautiful Persian, Turkish, Oriental and other textiles are a labor love. Unlike many machine manufactured “Oriental” rugs that can be produced in a matter of hours, a hand-woven area rug, beginning from the dying process to the completion of the weaving, can take many months or years to create a single rug. Want to know more? Visit our website to view videos on the dying and weaving process of beautiful wool area rugs. Oriental Rug Salon offers hand-washing of all Persian, Turkish, Oriental, wool and silk area rugs as well as area rug repair, fringe replacement services, and pet urine treatments for wool and silk area rugs. We also offer rug appraisals and evaluations. For more information about Oriental Rug Salon, please visit us online at www.OrientalRugSalon.com or call us anytime at 239-424-8171 – Lee and Collier County or 941-893-1655 in Punta Gorda, Port Charlotte, and Sarasota Fl.